Pumpkin carving? Bah. Costumes? Meh. For me, the real thrill of Halloween is spending late nights with a stack of creepy books and horror movies. Give me a bowl of popcorn and a homicidal maniac and I’m a happy girl. But the horror genre’s gotten a bad rap over the years, thanks to bad writing, bad lighting, and a string of six movies starring homicidal leprechauns. What these horror-snubbing snobs are missing, however, is that there’s a reason why there’s so much bad horror on the market: good horror is extremely hard to do. It’s hard work to make an audience of skeptics believe in talking ravens or flesh-eating zombies. We humans are cynics at heart: it’s much easier to laugh at a guy in a ski mask than it is to believe that guy in the ski mask is here to kill you. When horror’s done right, however, it’s a force to be reckoned with. Remember the first movie that made you sleep with the lights on? How about the first book that gave you nightmares? 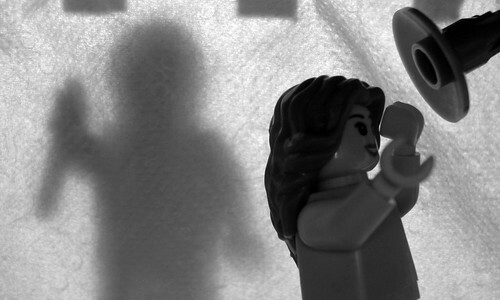 The horror genre is an art form– and it’s one all writers can learn from. So turn out the lights and get ready to learn from the masters of the macabre: here are the top six writing lessons to be learned from the horror genre’s best books and movies. 1.) Suspense is one of the most powerful weapons a writer can wield. The Lesson: Alfred Hitchcock is widely considered the master of suspense. Watch any of his movies– even the not-so-scary ones like North by Northwest or Dial M for Murder— and you’ll be amazed at how every scene keeps you on the edge of your seat. Though some would argue that Hitchcock’s 1960 classic, Psycho, isn’t necessarily a horror movie, the suspense carried through the movie is masterful (and not just in the infamous shower scene). The final scenes in the Bates household are especially excruciating for audiences wondering, What’s going to happen next? No matter what you’re writing, that What’s going to happen next? question is key. It’s not enough to write and expect your readers to keep reading; you want your readers to feel compelled to keep reading. Build that suspense and keep them on the edge of their seats– what’s going to happen next? How is this going to end? 2.) Surprise your audience when they’re least expecting it. The Lesson: There are two main tools a writer can use to instill fear and/or surprise into his audience: suspense and shock. While suspense is a long, slow buildup of tension, shock is the right-hook that comes out of nowhere. Consider John Carpenter’s 1978 thriller, Halloween. 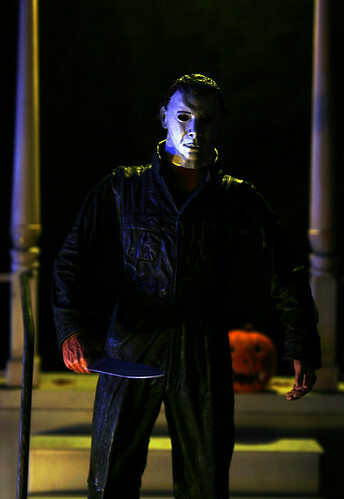 Just when we think Laurie (our heroine) is safe, out pops Michael Myers with a knife. Halloween is the kind of movie that makes you literally jump out of your seat. Surprising your readers– a joke out of left field, a shock-worthy statistic, publishing something outside your normal style– is the perfect way to keep your content fresh and exciting. 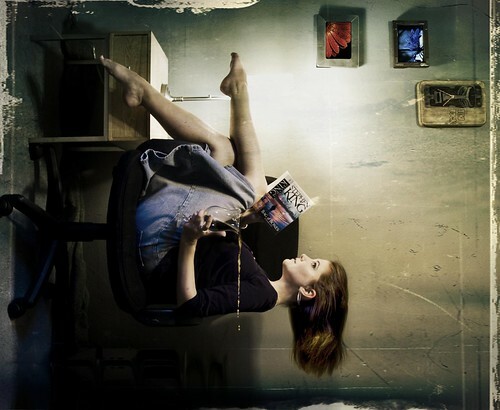 Keep your readers on their toes and you’ll never risk boring them. 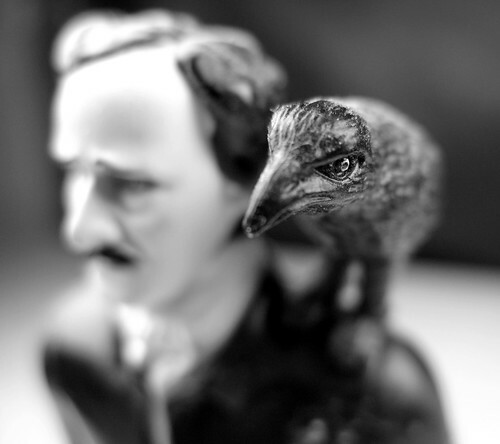 The Lesson: Poe is famous for being the master of the macabre– and for good reason. Poe actually wrote in several genres (science fiction, mystery, adventure, romantic poetry), but he’s best known as a horror writer. Why? Because Poe made his stories completely relevant to his audience, no matter how fantastical and wild his plots got: he was a genius at identifying and using his audience’s worst fears. Ever notice how so many of Poe’s stories (Ligeia, The Fall of the House of Usher, The Tell-Tale Heart, The Cask of Amontillado) involve being buried alive or coming back from the dead? In Poe’s day, being buried alive was such a huge fear that companies manufactured “safety coffins:” coffins with signalling mechanisms so the prematurely buried could signal to the outside world that they were, in fact, not dead. Poe identified his audience’s fears and wrote stories to match. By identifying your own audience’s fears, you’re identifying their needs; by identifying and writing for their needs, you’re giving them content they care about. The Lesson: Stephen King’s written some pretty outrageous plots over the years. Posessed cars, legions of vampires, shapeshifting clowns– sounds pretty ridiculous, right? Yet the foundation of King’s best works aren’t his far-out plots. They’re his characters. King grounds readers with relatable characters that we feel we know– we’ve seen them before, we’ve met them before, we understand them. No matter what supernatural hoops King makes his characters jump through, his books seem real because of how grounded in reality they are. Yes, this is doubly applicable for fiction writers, but it’s a good lesson for all writers: ground your work. Give your audience something they can relate to. A reader who can’t relate to your writing won’t be your reader for very long. The Lesson: If you’ve seen The Shining, there are no doubt some scenes burned into your brain: the twins. The gushing blood. Jack Nicholson’s face through the broken bathroom door. I’m shuddering just typing it– these are the scenes that will stay with us (and constantly freak us out) forever. Using vivid imagery is writing 101: it places the audience right in the center of your action. However, in online writing, imagery can take a more literal term: though your imagery in your prose is doubly important, you also need vivid images to keep your audience’s attention. Give them both literal and mental pictures they won’t forget. The Horror Classic: Any zombie movie ever– from Night of the Living Dead to Zombie Strippers. 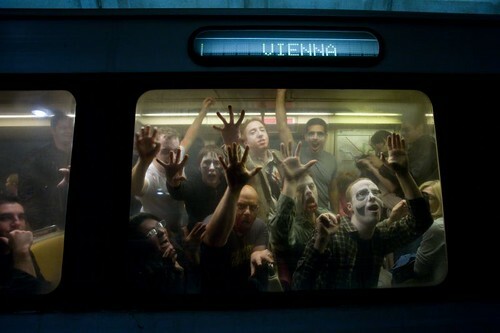 The Lesson: People really, really like zombies. What’s On Your Halloween Reading/Watching List? Chime in on this horrorfest: What’s the scariest movie you’ve ever seen? What horror book gave you the chills? And who’s got some horror-themed writing lessons to share?